Being a stay at home mother to three little boys doesn't allow for much extra time to venture out to the movies on a weekly or monthly basis. Don't get me wrong, we occasionally make it out to a matinee with the family for your typical run of the mill family flix, "MegaMind", "How to Train Your Dragon" or "Toy Story 3", to name just a couple. Both were, in my humble opinion, excellent movies, even if you're over the age of twelve! Needless to say, I still miss the more grown up movies. I have always been a movie lover! I typically even enjoy the movies most critics and even other people hate. It is only on a rare occasion that I watch a movie I just absolutely hate. I do, however have several in the dislike section. I can also gladly hand you a list of movies that make my favorites list, but be prepared for a notebook full. That's why Netflix has been a great addition to our family budget. I have been catching up on all kinds of movies and television series. When I say catch up, I mean watch anything that was released after the year 2002 and for the most part it's new to me. With this in mind, I would like to share a little blog piece, called Blue Moon Movie Reviews (Meaning you will see these reviews infrequently). While all the movies I will someday review may not be exactly retro, I do promise they will not be brand new, in the theater releases. So, you will be able to go to your local video store, Red Box, or add them to your Netflix queue. Just incase you are like me and lacked the time or the funds to catch movies in the theater, and need some suggestions on what to add to your queues. My most recent watches have included Firefly, The Notebook, Julie & Julia, Seven Pounds, and Stranger than Fiction. This leads me to my first feature on Blue Moon Movie Reviews(insert drum roll here), the 2006 release "Stranger Than Fiction"! Stranger Than Fiction starring Will Ferrell and Maggie Gyllenhall, as I said above, was released in 2006. This is probably only the second Will Ferrell movie that gets my stamp of approval. I am not much of a fan of the straight up comedy movies. They are in most cases just too silly for me. However, I did enjoy Elf! 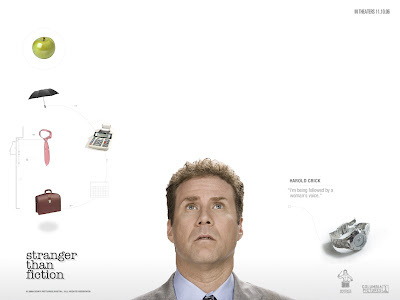 In many ways, Stranger Than Fiction, wasn't really your typical Will Ferrell movie. Will's character, Harold Crick, is a little stiff, after all he is a taxman. So in this case, stiff works just fine. Crick is a genius with numbers, but he counts too much, values his wrist watch like a best friend, all of which leads to very little actual social interaction. Overall, as you can imagine, he leads a very boring and lonely life. However, on one "nothing special, it's just a plain old normal Wednesday", Harold starts hearing a voice. Not only is he hearing a voice, but the voice is predicting his every move, and more importantly, his every thought. Suddenly, he realizes that he is in fact hearing, struggling author, Karen Eiffel (played by Emma Thompson) narrating his life. Also on this particular Wednesday, Harold meets strong willed, but generous natured Ana (played by Maggie Gyllenhall). He is suppose to be conducting an audit on Ana (this unusually, yet beautiful baker). She has intentionally decided not to pay a percentage of her taxes and decides to make Harold's job of conducting an audit as difficult as possible. A fight these two very unlikely love birds will never resolve. Then, right when life was getting a little brighter, a little problem occurs. Yes, a problem besides the voice in Harold's head, or the baker that he is falling in love with that doesn't want to pay her taxes. Yes, there was yet another problem. Harold hears the narrator of his life say in passing that he is going to die....OH NO! So, he enlists Professor Jules Hilbert(played by Dustin Hoffman) to help him figure out if his life is destine to become a tragedy or a comedy as the plot keeps unfolding in his head...... I will leave the rest as a mystery, so that if you haven't already seen this, out of the norm, Will Ferrell film, you can enjoy the ending for yourself. Tragedy or Comedy? What will the struggling, chain smoking, over analytical, author who always kills the hero write for the IRS man Harold Crick, and does she really control his fate? P.S. My favorite part of the movie is when Harold Crick brings 'FLOURS' to Ana, the beautiful baker. I know it's cheesy but I thought it was so thoughtful =)...Feel free to comment and let me know your favorite part of the movie!